There is always a lot coverage and debate concerning Bronze Age activity on Dartmoor but you hear very little about the Iron Age. Is it possible that some settlement sites were occupied right through from the Bronze to the Iron Age. In later times the occupation type may have changed from a permanent to a seasonal basis but none the less Iron Age people were living on the moor. One such possible example is the small settlement located in an enclosure called ‘Gold Park’ which is located just north of Hookney tor. The site sits on the eastern flank of the ridge which runs from Hookney tor to Shapley tor at an altitude of about 450m. The whole area displays evidence of Bronze Age activity in the form of reaves, cairns, hut circles and the nearby pound called Grimspound. The map below shows the settlement site along with the topographical landscape in which it sits. As can be seen the site is well protected from the prevailing south westerly winds by the Hookney and Shapley ridges. 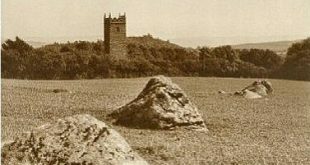 The fact that there is no 360º field of vision suggests, as with Grimspound, that defence was not a major consideration for the settlement’s location. Gold Park is a typical example of a Dartmoor newtake which could be described as the top layer of the landscape palimpsest. This would have been post medieval in origin whilst the next medieval layer would be the nearby tinner’s hill-drainage pond in the adjacent newtake. Below this imaginary layer comes the Iron Age settlement and below that the Bronze Age hut circles. One of the major factors influencing the location of a settlement is a nearby water supply and as can be seen from the plan below the West Coombe Stream rises about 200m to the east. A platform settlement was identified at Gold Park in 1983 followed by a survey in 1984 which it was hoped would put the site in some sort of archaeological context. Later in 1984 an excavation was carried out which was finally competed in 1986. The dig revealed a platform house or house platform which according to the NMR is, “a levelled area of ground on which a house is built. A platform is often the sole surviving evidence for a house“. After taking away the turf the site was then hand-trowelled down to revealed several phases of development. It is thought that the actual platform was originally made by digging into the hillside to create a deep, semi-circular scarp. The spoil from this was then deposited on the eastern downslope in order to make a flat, semi-circular apron which formed a circular, level platform. The next stage of the site was the construction of a circular ring-groove timber house which had a diameter of 8m and a floor space of 53 sq. m. A ring-groove, once again according to the NMR, is “a gulley in the form of a circle for holding vertical posts in the walls of iron age round houses“. There was an internal ring of seven post-holes which probably supported the roof. The doorway faced in a north-easterly direction which afforded good shelter from the predominant south-westerly weather. A small hearth was discovered in the centre of the floor alongside which was a flat slab, this had edge-set stones packed around it, presumably to hold it in place. Gorse and hazel charcoal was found in the hearth giving a good indication of what fire wood was being used. A later radio-carbon date was fixed at 240±60bc which calibrated to 375-176BC thus placing the first structure to the Middle/Late Iron Age. For some reason the timber house was then simply abandoned and left to decay as suggested by a turf-line which formed over the site. Then an Iron Age ‘developer’ came along and decided to re-inhabit the site, after all it had splendid views, cold running water and presumably planning permission. This time the dwelling was a stone built structure albeit a little smaller than the original. The dimensions of this new ‘DesRes’ was a diameter of 6 – 7m with an internal diameter of 4 – 4.5m thus giving 14sq. m of living space. There appeared to be no post-holes with this construction which could indicate that the roof poles rested on the stone walls. If this was the case then it has been estimated that they would have been laid at an angle of 40 – 50º thus giving an internal roof height of 3m. This time the builder decided to virtually turn the dwelling through 180º as the doorway was located on the south-westerly side. It appears that there was a cooking hearth on the western side of the house and a fire-place located at the centre. Gorse, Hazel and Oak charcoal were present in both places and the hearth charcoal gave a radiocarbon date of 130±60bc which calibrated out to 187 – 35BC. From this date it could be suggested that this second building appeared roughly 140 years later or that the first house lay abandoned for that period. A few sherds of pottery were found and these have been classified as South Western La Tène or Glastonbury styles both of which would point to a Late Iron Age date. This dwelling then begs three questions; who was living here, when were they living there and why? To start with the easiest question, it is assumed from the radiocarbon dates that people were intermittently living on the site from the middle to the late Iron Age in two distinct phases of occupation. Then things get a bit tricky, who was living there and why? It can be fairly safely assumed that these people belonged to the Iron Age tribe known as the Dumnonii. Whether they belonged to a clan within that tribe nobody knows, but in other parts of the country there are beginning to be suggestions that there are clusters of Iron Age settlements and hillforts that could be clan based. The nearest possible cluster is that of Cranbrook Castle, Prestonbury Camp and Wooston Castle which as the crow flies is about 5 miles away. However the nearest hillfort is that of Hunter’s Tor in Lustleigh Cleave which again as the crow flies is 3.7 miles away and Holne Chase Castle about 6 miles away. From other Iron Age sites it is known that during the Middle to Late Iron Age the need for defence was increasing as shown by the earthworks and the amount and style of the weaponry found. In which case does it not seem a bit strange to have such an isolated settlement as that at Gold Park. Well it would if the dwelling was occupied 24/7 but possibly not if it was only for use during the summer grazing period. In other words it was a ‘shieling’ used for the transhumance of livestock, do you know? that word shieling, to this day I only remember it because at school it was explained as, “what Heidi did with her goats,” and was accompanied by a yodelling teacher – never forget it. Sorry, yes, Gold Park, it might have been an area of grazing where people took their livestock in the summer and stayed at the dwelling whilst there. As soon as the weather turned wintery they up sticks and moved back to their settlement on the lower edges of the moor – possibly one of the hillforts. The picture below was taken in 2006 which is meant to be a period of global warming so imagine what it would have been like at Gold Park 2,000 years ago? Could this also indicate the reason for a summer shieling as opposed to a permanent dwelling? The biggest problem when trying to look at Iron Age Dartmoor is the lack of archaeological evidence when compared to other parts of the country. It may well be due to a mis-interpretation of other supposed Bronze Age features that has left the moor lacking in Iron Age occupation evidence. The other part of the 1984/86 excavations was to examine three cairns near to the platform house. This work revealed post-holes and stake-holes under the cairns which were suggestive of timber structures dating to the Late Iron Age. In the end the cairns were deemed to be stones cleared from the land or clearance cairns as opposed to ritual cairns but none the less what else is hidden under such features on other parts of the moor? Gibson, A. 1992 Excavation of an Iron Age Settlement at Gold Park Dartmoor, Devon Archaeology Society No. 50., Sutton Publishing, Stroud.